Muted calming colours in our homes evoke feelings of a relaxing and inviting room, sleek chic monochrome tones add an air of sophistication and bold pops of colour or metallic accents are all great ways to add warmth and personality. But when you are considering investing in the ultimate luxury for your home – a bespoke kitchen designed to your own exacting desires, just how do you create a timeless look which won’t outdate, fall into a trend trap or become time-warped? Lighting is the answer. Cleverly concealed, mood creating, focussed or fading, lighting is the one area in which you can go to town and change the look, colour scheme and ambience of your kitchen at the flick of a switch. 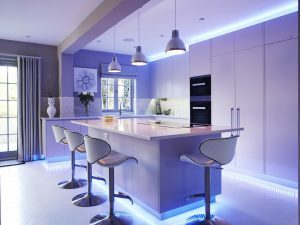 The correct lighting with different levels of brightness can not only enhance smaller compact kitchens to appear more spacious, but equally dramatically change your kitchens look and allow you to set the mood. Alongside the focus lighting on the main food preparation areas where good crisp lights are essential, you can also include accent lighting and ambience lighting, all operated individually for complete control. 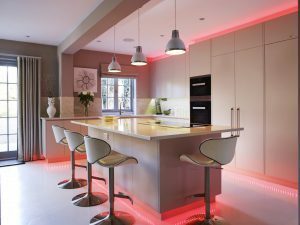 Accent lighting highlights points of interest in your kitchen, whereas ambient lighting can be achieved by adding LED strips to the under cabinets and island to create a floating effect and gentle attractive glow. Adding lighting inside your cabinets which can be activated as they open is another sleek and effective touch as well as being practical. At Woodstock, we consider lighting to be just as important a consideration as the overall design of your kitchen and an essential reflection of your personality.